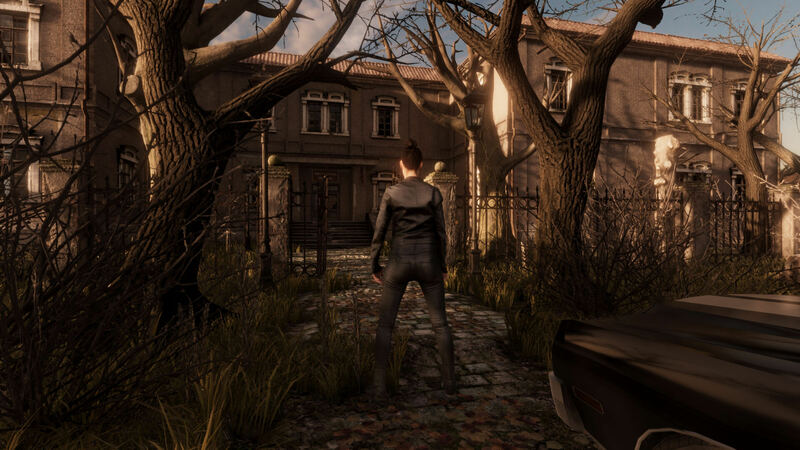 Join Victoria Miller as she sets off on a journey across the US in hopes of finding the poltergeist who killed her entire family and getting her revenge in this horror-themed match-3 adventure, Victoria. From banishing malevolent spirits and slaying supernatural beings, you’ll provide Victoria with the aid she’ll need in her grueling task by making strategic matches and using her many weapons when necessary. Will you be able to help Victoria to finally find peace after the tragic death of her family? Victoria Miller lost her husband and two children in a tragic incident involving an aggressive poltergeist. Driven by her bitter need for revenge, she decided to pick up the ancient art of hunting supernatural beings and track the poltergeist across the United States. From werewolves to vampires, you’ll be able to play a crucial role in helping Victoria slay them all, essentially freeing the people who are trapped under these beings’ reigns of terror. 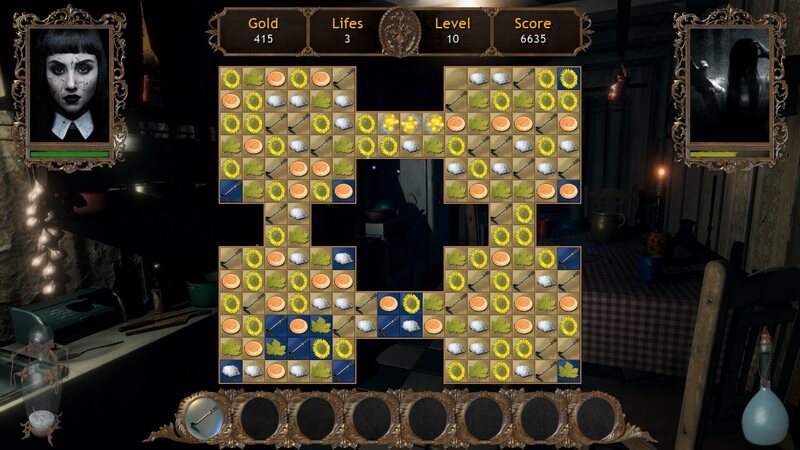 At its core, Victoria is a pretty standard match-3 puzzle game where you’ll need to make matches of 3 or more in order to remove the items from the playing area. 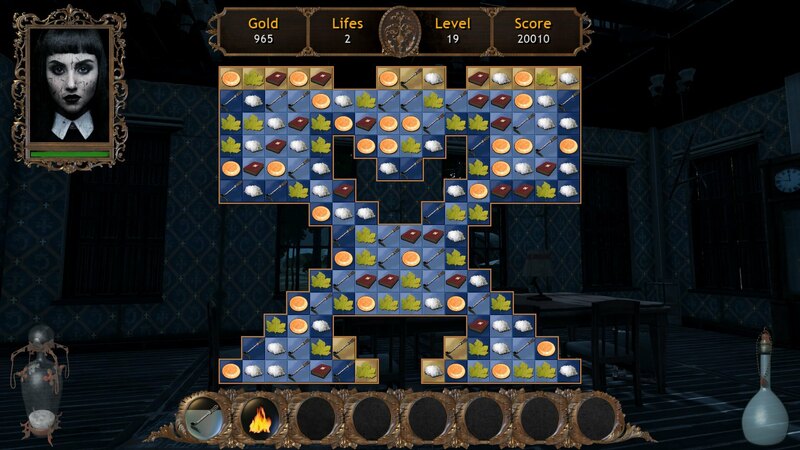 Most levels require you to clear away blue tiles by matching over them but sometimes, you may be asked to make specific matches in order to use the many weapons that will eventually be available to you against the supernatural creature you’ll be fighting. Unlike current match-3 games, this game doesn’t limit your moves. Instead, you are given a time limit of sorts. If you don’t manage to clear away all the blue tiles within the time limit, Victoria will lose a life and you’ll have to start that level over. Victoria has 3 lives to start with, but I’m not very sure what will happen if she lost all her lives though – will you be forced to start from the very beginning, and not just the level you’ve failed in? Anyway, I find it rather annoying that this time limit is not shown anywhere in the game. The only hint you’ll get is the sound of an increasingly-rapid heartbeat – the sound indicates that you’re close to the end of the time limit. That being said, it would have been nice if Victoria’s health bar is turned into a time limit indicator. That would be quite interesting and unique. There are no special power-ups you can get by matching more than 3 items at a time, but the game does provide you with a range of ghost-hunting weapons that works exactly like a power-up. For instance, the Fire Poker can be used to clear away a single layer of blue tile while Fire itself can burn away all the blue layers of a single tile (presumably). 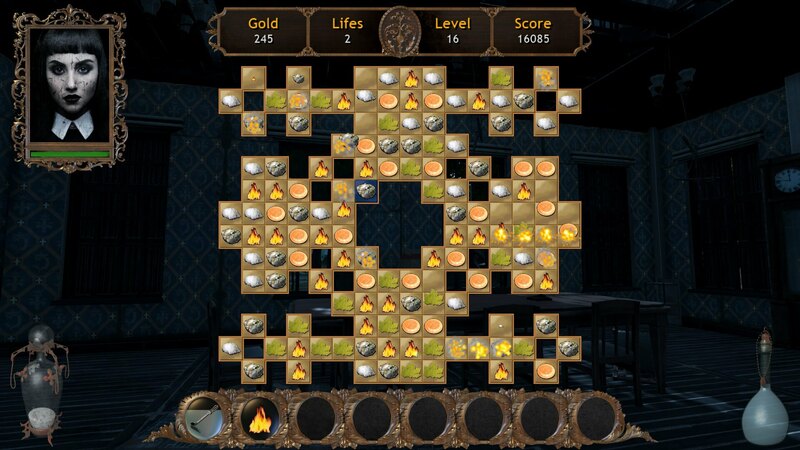 However, to use these weapons, the weapons will need to be charged up first, and to do that, you’ll need to make matches using only the tiles with the weapons’ icons on them. For certain levels, these weapon tiles also double as… well, weapons. By matching them, you’ll be able to deal some damage to the supernatural creature you’re fighting against, be it a vengeful spirit or nasty witch. However, while matching, I hardly noticed that I’ve defeated the enemy. It would be nice for the creature, whatever it is, to emit a shriek or a howl of defeat after it’s slain. I also find it weird that sometimes, messages like “Attack Blocked” will pop up on the screen. I’m not sure what this message indicates since it doesn’t seem like Victoria’s being attacked by the supernatural being. 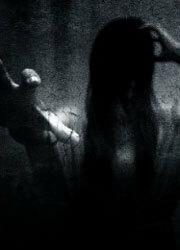 Being a horror-themed game, Victoria provides a nice and creepy atmosphere for you to be immersed in. Aside from the occasional eerie slam of the door or creaking of the stairs, the game also features jump scares that are intended to give you a scary jolt from time to time. You can try to avoid getting jump scares as often by matching salt tiles though. Granted that the jump scares aren’t exactly very frightening unless you happen to play the game in the middle of the night, I find myself constantly bracing myself (mainly bunching up my shoulders) as I play. 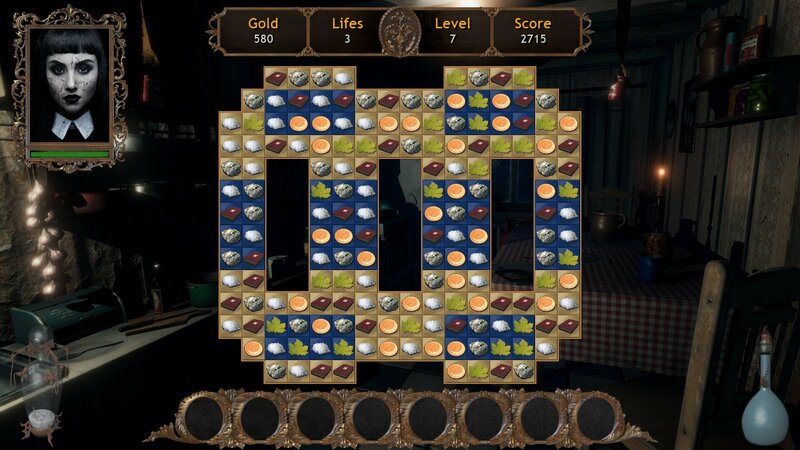 Victoria is definitely not the sort of match-3 game you’ll want to play to relax – it is more of a game that you play if you’re looking for a creepy thrill. 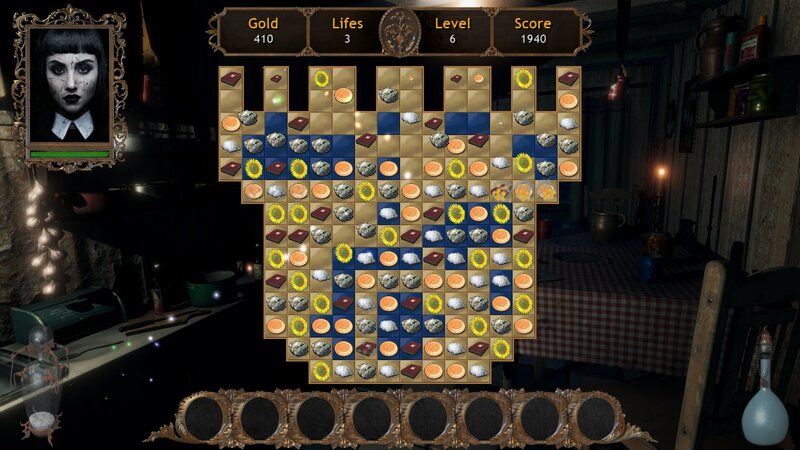 Victoria is a brand-new single-player game and as such, there isn’t much of a community around the game at the moment. However, if you find that you’ve enjoyed playing the game, maybe you could gift a copy of the game or recommend the game to your friends. The graphics in this game is superb! The dark background really brings out the fear of the unknown in you and they are also varied, showing that you’re actually move from room to room while hunting for the supernatural being. 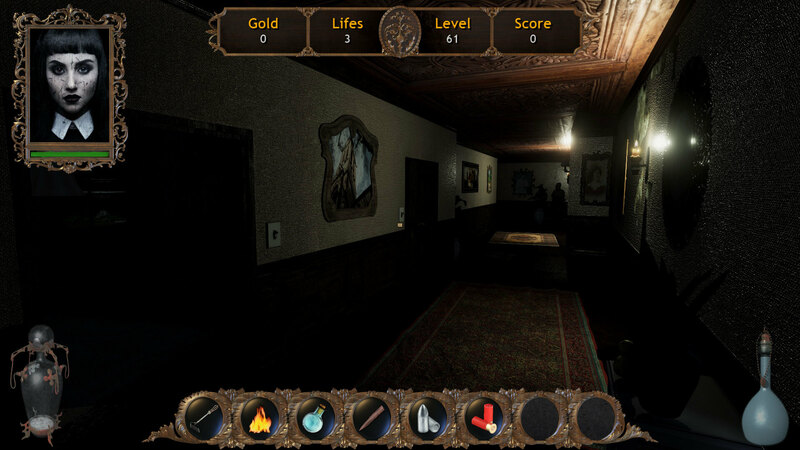 Couple that with excellent and randomly-timed sound effects, such as a ghostly wail, the crackle of thunder, or the creaks and groans of an old house, and music that covers you with a sense of foreboding, and you’ll get an eerie game that’s truly immersive. If you really want to enjoy the game to the fullest, I’d recommend you to play the game in the middle of the night. Every sound in the game seems to be amplified and the jump scares becomes a whole lot scarier. When it comes to immersion, Victoria hits the nail on the head with its dark visuals, multiple jump scares, as well as creepy sound effects and music, giving it the perfect atmosphere for a horror-themed game. However, despite the supernatural-fighting bits, the gameplay in this game can be rather simplistic, and after some time, rather mundane. There are also several aspects of the game that I believe needs to be improved, such as giving the players a time limit indicator, and making the defeat of a supernatural being a much bigger deal as opposed to being something that you may not even notice. by Aethyna Feb 8, 2019 Join Victoria Miller as she sets off on a journey across the US in hopes of finding the poltergeist who killed her entire family and getting her revenge in this horror-themed match-3 adventure, Victoria. Will you be able to help Victoria to finally find peace after the tragic death of her family? Read More Be the First to Post a Review!